Recently the Browne Family unexpectedly learned that unfortunately, due to complications with Danny’s diagnosis, his SDR surgery at St Louis Children's Hospital in the United States is now in doubt. We are devastated by this development and heartbroken that there is no longer a clear path forward for Danny. Our amazing little three year old still cannot walk and we now do not know what the future holds for him. Following a review of Danny's most recent MRI scan, a previously undiagnosed complication involving the narrowing of his spinal canal has been detected - this means Danny may be unsuitable for the surgery and on the recommendation of his surgeon his operation has been cancelled. In light of this information, all fundraising for Danny's First Steps has been suspended indefinitely. We have contacted all Go Fund Me donors directly to request their details so that donations can be refunded. Danny will continue with his intensive physiotherapy at First Step Clinic in Limerick and we will start the process of investigating the options for his future development with healthcare professionals both public and private. Val, Kelly Ann, Danny, Emily and the extended Browne and Geraghty families wish to sincerely thank all donors and supporters for your generosity, kindness and prayers. We have been overwhelmed by the love and support for Danny since his story first became public. Over the past few months, we have learned the true meaning of community as the people of Ballygar, Roscommon and beyond have rallied around to support Danny. Thank you to each and every person who has put their hand in their pocket, cheerfully donated their services, time and effort to help Danny on his journey. We are very fortunate to have such good family, friends, neighbours and supporters. Danny Browne is the three-year-old son of Kelly Ann Geraghty of Ballygar and Val Browne, Roscommon. At the age of two, Danny was diagnosed with Cerebral Palsy Spastic Diplegia, a painful condition that affects Danny’s ability to stand and walk independently. The Browne Family has spent many months researching options to give Danny the best possible chance of walking. Danny has been attending intensive, private physiotherapy in Limerick which has led to an improvement in his strength and mobility. Danny has also been accepted for a life-changing surgery called Selective Dorsal Rhizotomy (SDR) at St. Louis Children’s Hospital in Missouri. 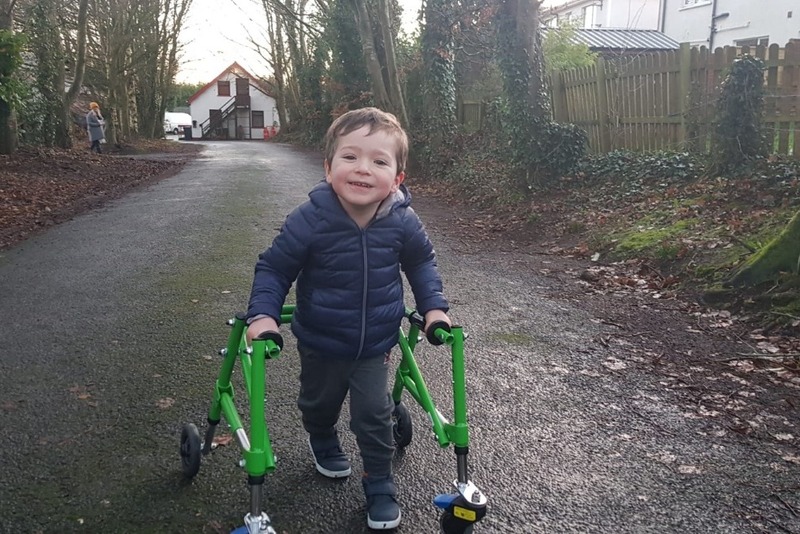 This procedure, which is due to take place in February 2020, will give Danny the opportunity to walk unaided and significantly reduce his daily pain. It will mean that watching life from the sidelines will become a thing of the past for Danny. In order to prepare for the procedure and undergo the intense physiotherapy required following the surgery, Danny will need to spend up to six weeks in St. Louis. The cost of the surgery, travel and associated expenses, as well as ongoing physiotherapy for Danny in the months and years following the procedure, are monumental for a young family. This Go Fund Me page has been set up to raise a portion of the funds which will be needed. The funds raised online will be supplemented by several fundraising events taking place over 2019. The Danny’s First Steps Trust is seeking the support of Danny’s, family, friends and community to raise the much-needed funds to help this beautiful, bright little boy to walk and to reach his full potential. * This Go Fund Me page has been set up by Danny's parents, Val and Kelly Ann Browne of Roscommon and the Danny's First Steps Organising Committee. The Organising Committee consists of Una Fannon (Chair), John Campbell ACCA (Treasurer), Ruth Beattie (Secretary) and Niamh Keenan. All funds raised online will be transferred directly to the Danny's First Steps Trust account in Ulster Bank. The funds will be administered by Treasurer John Campbell ACCA and all expenditure will be signed off by the members of the Danny's First Steps Trust. Full audited accounts will be available to anyone who wishes to view them on request. Yesterday, the Browne Family unexpectedly learned that unfortunately, due to complications with Danny’s diagnosis, his SDR surgery at St Louis Children's Hospital in the United States is now in doubt. We are devastated by this development and heartbroken that there is no longer a clear path forward for Danny. Our amazing little three year old still cannot walk and we now do not know what the future holds for him. Following a review of Danny's most recent MRI scan, a previously undiagnosed complication involving the narrowing of his spinal canal has been detected - this means Danny may be unsuitable for the surgery and on the recommendation of his surgeon his operation has been cancelled for now. We are unsure if this cancellation is permanent or not. We are working with Go Fund Me with a view to refunding donations over the next few days and weeks.